Purchase items that can be made into several meals, like a whole roasted chicken, or bag of sweet potatoes, and shop the periphery of the grocery store, avoiding the middle aisles full of processed and higher-priced foods. Another Monday and as usual I never plan on getting much done, but I do fill out the weekly menu plan and dig into the freezer and vegetable bins to see what needs to be used up before the next grocery shopping trip. This week I have some great sweet potatoes, I have a new cookbook, Jacques Pepin Heart & Soul in the Kitchen and as luck would have it the cooking club has chosen a pot luck for this week from any one of the chefs on the list so I begin with a recipe for broiled sweet potatoes from the book and a favorite flounder with lemon butter recipe for dinner. Both very easy and delicious. 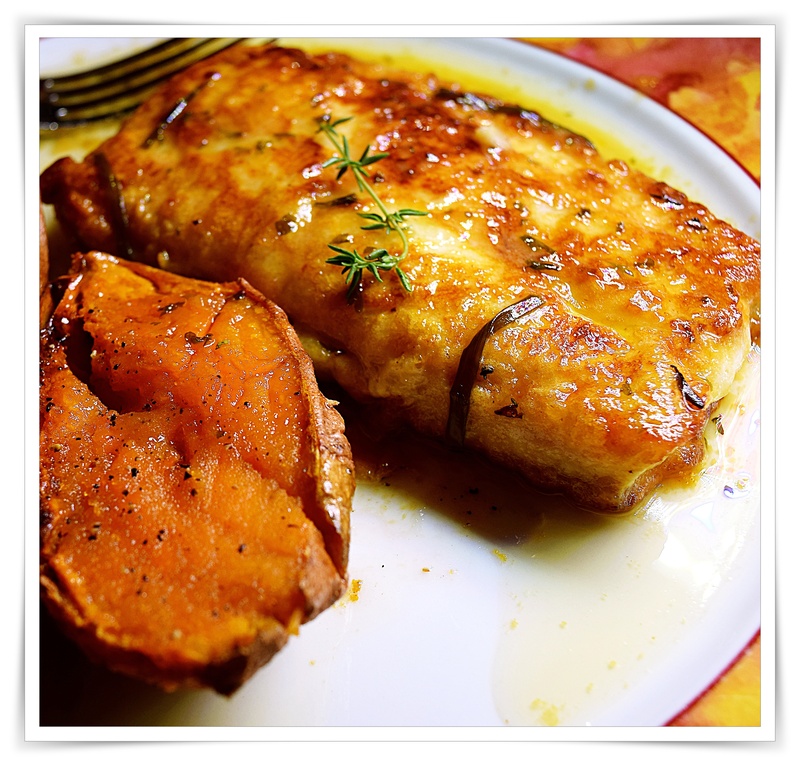 I love the packaged small sweet potatoes in the stores these days and since Jacques starts with an 8 minute zap in the microwave then another 7 minutes under the broiler, you are well under a 30 minute time frame and in that time you can sauté the fish and make the pan sauce. I think that the sweet potato recipe would be perfect for a large gathering and I’ll keep this recipe in my go to files. For the sweet potatoes: mix together 4 tablespoons melted butter and 4 tablespoons of good real maple syrup. Puncture the potatoes with a fork or make a few slits with a knife, microwave sweet potatoes (medium size) for 8 minutes, remove from oven, slice in half length-wise and score, brush with some of the butter and syrup, season with salt and pepper broil for about 4 minutes, turn the potatoes over and broil for another 3 minutes. Serve, cut side up and brush with remaining butter-syrup. “Dip the fillets lightly in the flour to coat them on both sides, tap off any excess flour, then dip in the beaten egg, coating them on both sides”, flour first then into the egg wash? It all worked out just fine, but I have never done that before…a tasty little treat for the fish crispy fried capers, but I forgot them at photo time. Also my fillets were on the thick side so I finished them in the oven. The oven was just turned off broil so after a few minutes the residual heat was perfect for finishing the fillets, about 3 minutes. Spread the flour on a plate and the beaten egg on another plate. Heat the oil in one very large (at least 12-inch) nonstick skillet or two smaller nonstick skillets over high heat. Pat the fillets dry and season with the salt and pepper. Dip the fillets lightly in the flour to coat them on both sides, tap off any excess flour, then dip in the beaten egg, coating them on both sides, and arrange side by side in the skillet(s). Cook the fillets for about 1 1/2 minutes, then turn them over with a large spatula and cook them for 1 1/2 minutes on the other side. Transfer the fillets to four hot plates. Add the butter to the large skillet or one of the smaller skillets and when it has melted and is hot, add the lemon juice. Shake the pan to combine the ingredients, and pour the sauce over the fish. Sprinkle with the chives and serve. Great looking meal. 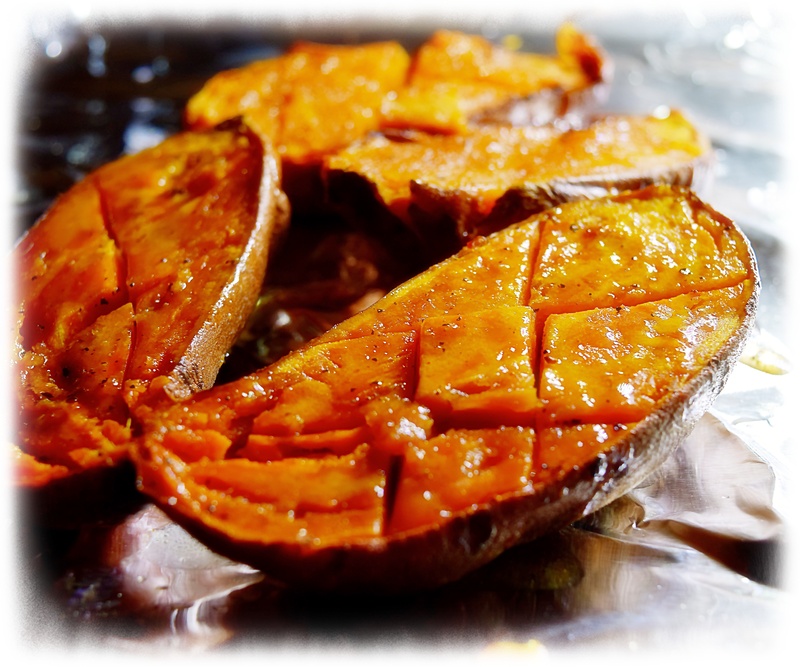 I have done sweet potatoes this way and they are so good…the method I had was to score them and bake them, or to score them and bake them scored side down on a sprayed piece of foil…but I like the sounds of the method you did and I will give that a try as well. I recently bought Jacques book and have fallen in love with it. He is just one of my all time favorites. While I love sweet potatoes, it’s your flounder that is stealing the show for me right now. It looks so flaky and succulent! We certainly are lucky to have fish just off the boats in our area and I have seafood for dinner at least 3 times a week. I love Jacques book and if I’m not wrong I think that it will be the last of his PBS series. I normally don’t microwave potatoes, but it sure was the way to go if one is short of time and the best part is that I would have never known they were since they were “sauced” and broiled making for a great company dish.